The refugee crisis has been on my mind for a while now but I've been struggling with how to help and how much to share with my young kids. We've read books about refugees to start the discussion with our kids. We've seen great examples on the Little Hands Can blog of kids sorting presents for refugee families relocated to Colorado and of kids making dolls for refugee children in Greece. Now what were WE going to DO? We started by looking at photos at Operation Refugee Child and talking about what it might be like to be a refugee. Like, maybe it would be fun to sleep in a tent for a few nights but my kids decided that after a while it wouldn't be much fun. Operation Refugee Child has a campaign going right now to send backpacks filled with supplies to kids in refugee camps. They have a whole list of needed supplies and make it easy for you to send it to their warehouse and they'll pack it in a backpack and send it along to where it's needed. You can also buy a backpack to be filled with supplies. My daughter, Anna, decided to spend some of her hard-earned money to buy a backpack for a refugee child. There are also several sites where you can send a message of hope to a refugee. You can send Letters of Hope through CARE, a welcome note to a refugee newly arrived in the US through Amnesty International, or a postcard through Any Refugee. 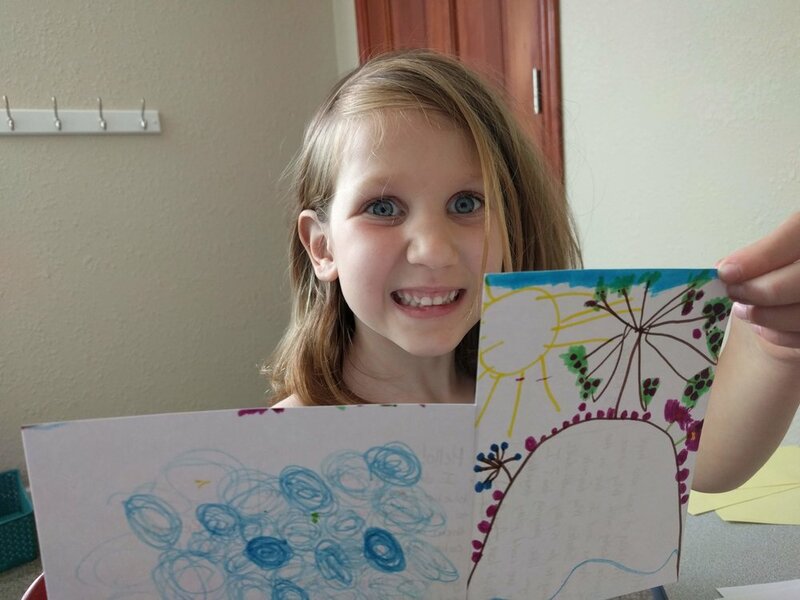 Anna loved the idea of drawing pictures on handmade postcards. As she drew and we talked, the kids we were sending these cards to became real. She realized that they weren't so different from her and started asking more questions and wanting to do more. I love that about service - so often a little act leads to so much more compassion and a desire to do more. When she was done drawing, she dictated to me, with some prompting, what to write. We bundled them in an envelope and sent it off. The refugee crisis isn't over and neither is our quest to help. What ways have you found to help refugees? We'd love to know and do more. Little Hands Can...make a world of difference!